Okay, before I proceed with those steps, I have some questions! First, do I really need to uninstal chrome? I'm prefeering firefox tbh lol. Also, the pc is already fixed it seems, with no problems. It runs perfectly smooth and better than ever Thanks! Should I still run those scans? Yes please run the scans in case there is anything still to address. If you don't want to install Chrome that's up to you and your choice, you don't need to. 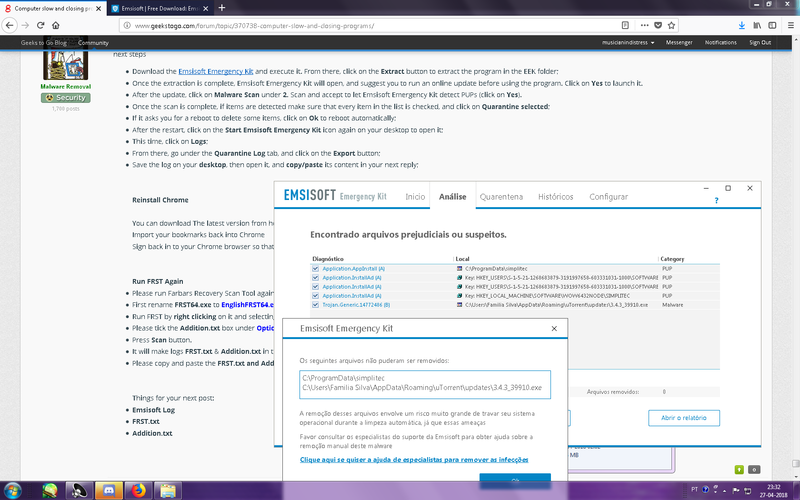 Click OK and see if Emsisoft will quarantine them. Uncheck the 2 items Emsisoft can't qaurantine and it should go through. Then run FRST. Hi, I tried to move the rest to the quarantine and it stops halfway through, and doesn't send them to the quarantine. I click the button to move and then the dialog dissapears, and if I click the move button it goes away again. Leave Emsisoft just now and run this tool instead. Temporary disable your AntiVirus and AntiSpyware protection - instructions here . Download esetonlinescanner_enu.exe that you'll be given link to. Make sure that Enable detection of potentially unwanted applications is selected. Enable detection of potentially unsafe applications are checked. Enable detection of suspicious applications are checked. Enable Anti-Stealth technology are checked. Make sure that Clean threats automatically is unchecked. Use custom proxy settings is unchecked. When the scan is done results will be displayed. Click the Copy to clipboard. Then click Do not clean. Place a checkmark at Delete application's data on close, click Finish and close the program.